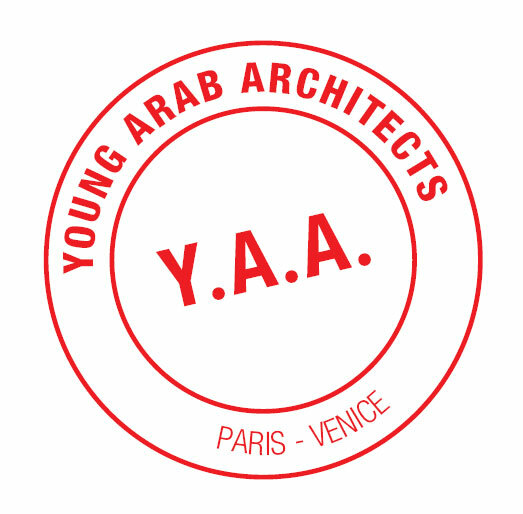 This design competition is open to all students, architectural professionals, and artists. The aim of the competition is to further and expand a dialog about green thinking in Asia. The competition site is located in Shanghai, China. 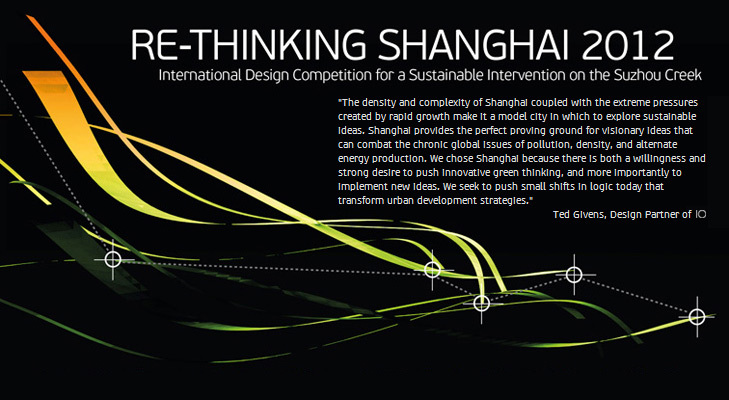 Entries will be evaluated upon design merit, quality of sustainable ideas, and the impact proposal will have on Shanghai. The winner of the competition will get 3 months to work in 10 DESIGN’s Hong Kong or Shanghai office to further develop their ideas. An international jury composed of magazine editors, educators, and design professionals will select the winning entry. An exhibit of the winning entries and other notable submissions will be held both in Hong Kong and Shanghai and then at various universities and venues around the world. 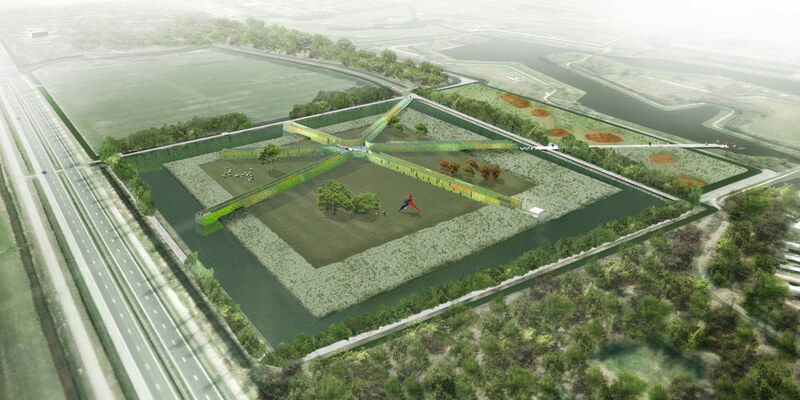 LOLA landscape architects, Deltavormgroep en Piet Oudolf have won the commission for the extension of the historical park Groot Vijversburg in the north of The Netherlands with their submission “Star Maze”. For the tender five teams were selected. The other design teams were: B+B in collaboration with Michael van Gessel, OKRA, Hosper en Strootman. Park Groot Vijversburg is a romantic public park with a growing art collection, located in the north of The Netherlands. The park is broadening its boundaries and is ambitious to become a national destination. The winning landscape design gives a contemporary interpretation to two new park chambers which create a link between the historical park, a post-war recreational area and a nature reserve. The Luminous Pathway in the Quartier des Spectacles has taken an important step forward with the illumination of the Université du Québec à Montréal (UQAM) design centre and the Grande Bibliothèque belonging to Bibliothèque et Archives nationales du Québec (BAnQ). 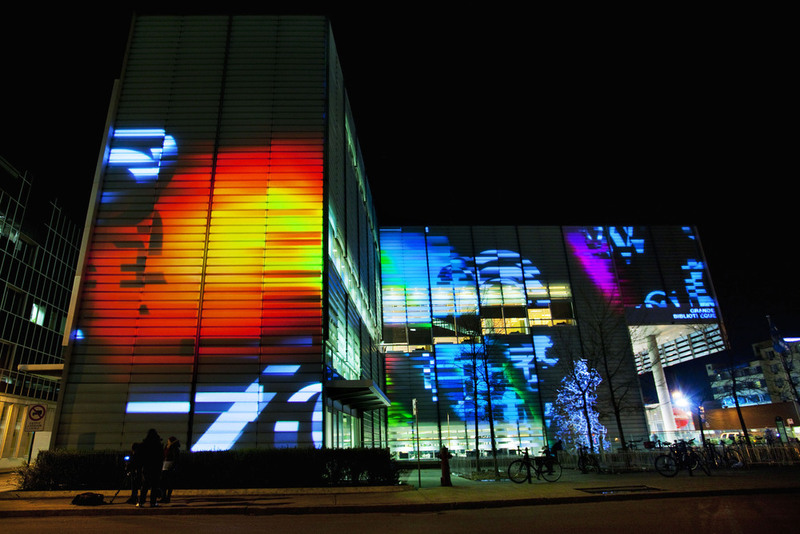 Using new, permanent video-projection devices that make it possible to illuminate entire building façades, these new lighting designs are a testament to the significant creative potential of this ambitious urban-branding project. With the help of powerful software by Montreal-based developer VYV, the new devices will provide an all-seasons interface between Quartier des Spectacles visitors and the exciting programming presented in this vibrant concentration of cultural venues. By adding these tools to those already available to Luminous Pathway artists, there is now a vast array of new possibilities for collaboration with designers. They will be able to use high-end equipment to present digital works that will, after dark, create outdoor reflections of the exciting cultural activities going on indoors. 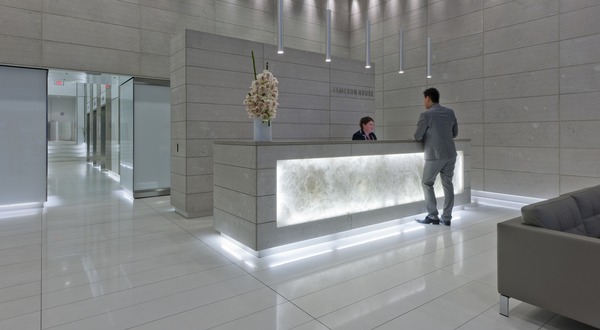 A temporary construction that was intended to be immaterial, built with light, swift as the design and assembly. An ethereal ceiling (less enlightened than anticipated in the project) has helped to remake the human scale in the exhibition pavilion. 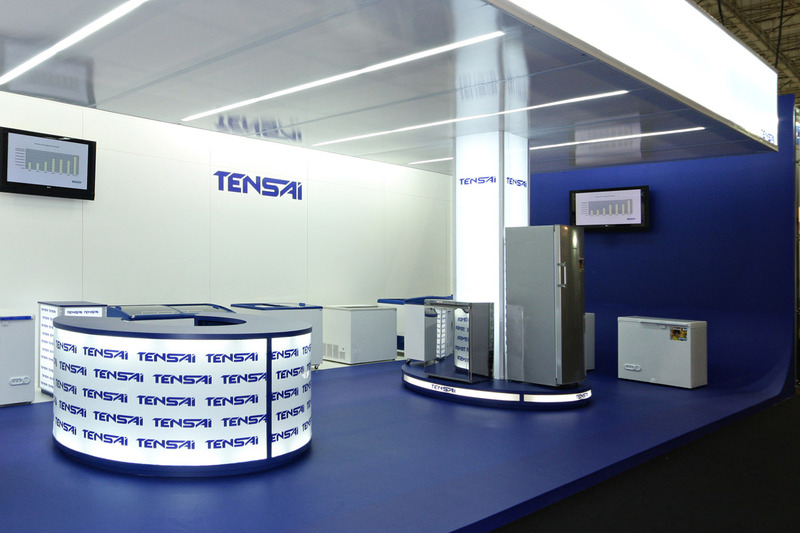 A blue track became the continuous background in wall and floor, where three cylinders with expanded light rest, showcasing anchor home appliances and receiving visitors. 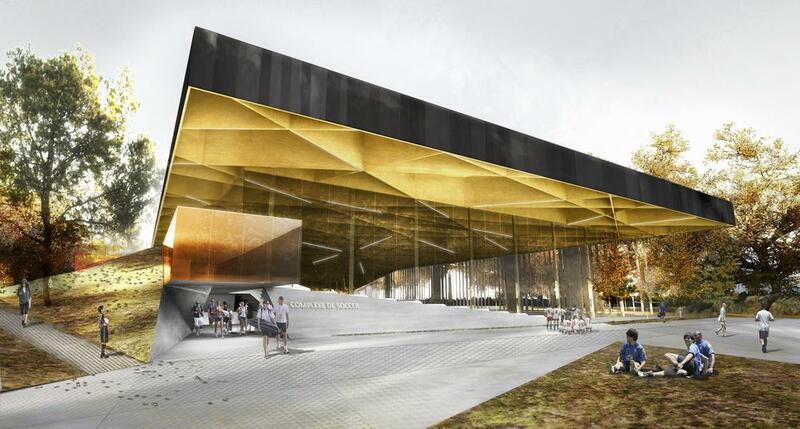 The Mayor of Montréal, Gérald Tremblay, unveiled the winning project in the architecture competition for the new indoor soccer centre at the Saint-Michel Environmental Complex (SMEC). The jury has chosen the concept developed by Saucier + Perrotte / Hughes Condon Marler Architects from among the four submitted by the finalist firms. The proposal of Dreiecksplatz wins the unanimously voted First Prize for Europan 11 in Vienna, Austria. No runner-ups or honorable mentions were selected for this site. Located between the Vienna Ring and Vienna Woods, the site embraces the marks of both environment – urban and nature – as a basis for future development. Currently surrounded by houses with a large amount of private green space, what is needed in the site is a generous, quality public space that will invite and sustain diverse groups of community to gather, live and work by. Major forms of transit – bus, tram and bicycle – anchor three corners of the triangle-shaped plaza with an integrated train platform in the middle. Various residential, commercial and social programs both frame and spill out toward the public triangle and support its liveliness. Green space is maximized at all different scales, fostering health, education and social interactions, while each kind of nature – from ‘wild woods’ to herb garden – defines the atmosphere of individual housing zone.